By now you should already know that texting-and-driving, also known as distracted driving, is a risky bet. We in the insurance business, especially the auto insurance segment, are eager to get the word out to those who don’t know, or won’t listen. Hopefully, together, we can all help to mitigate or possibly eliminate this risky behavior. In a recent study by the Virginia Tech Transportation Institute, it was found that the manual-visual tasks associated with your phone (or hand-held devices) increases the risk of being involved in a car accident. This is classic distracted driving stuff! The manual-visual tasks they’re referring to included reaching for and dialing you phone … and of course … TEXTING! 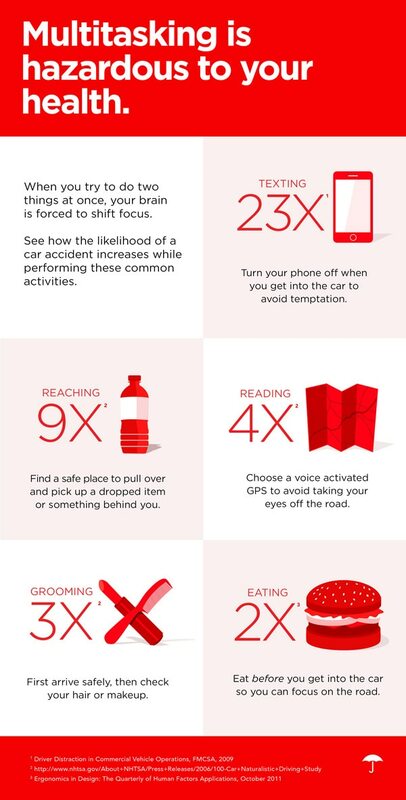 These behaviors can increase the likelihood of getting into a car accident by as much as three times. That’s significant. If you’re thinking that you’re safe because you use a hands-free device, think again. While it is true, you’re at a reduced risk, it’s still associated with a greater risk of a car cash. Before you take that next call, or check your email or texts, be aware of all the statistics behind distracted driving. Read the infographic below and share this post with friends and family. The more people are aware, the better we all are. Join all insurance companies, safety experts, and insurance agents who are trying to get the word out about distracted driving. Keep our roads safe, keep our teens safe, and keep up the vigil.